I wanted to say the magic happens when we practice our sadhana. The truth is magic is happening all the time, but we can’t see it unless we maintain the tapas, the fire of motivation and discipline of daily sadhana. The hustle of our lives blurs our vision of reality; we walk around and interact with skewed perception of what’s objectively happening. 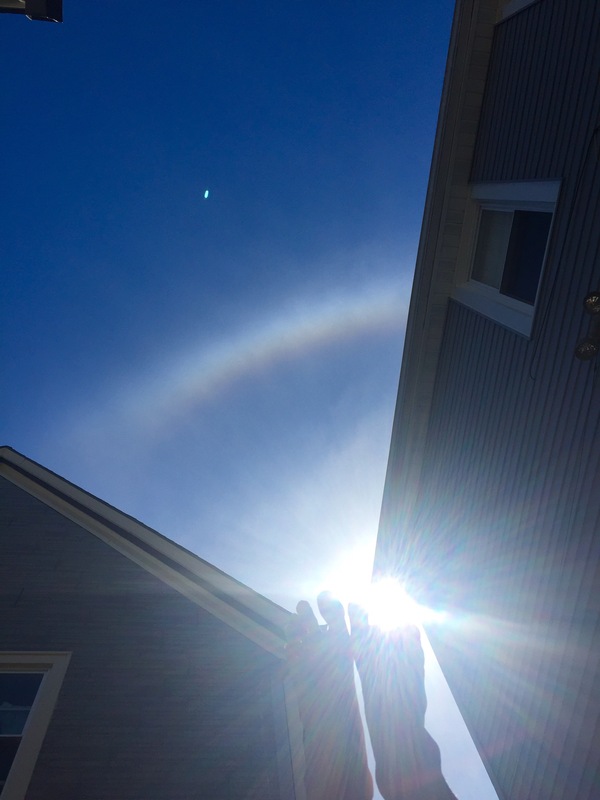 I found this sundog when I pulled my mat outside for my sadhana of asana and japa. I never would have noticed it had I not laid down on my mat to begin my practice. The magic is waiting for us to connect to it, the problem is that most of us don’t have the tapas to keep returning again and again, which is what it takes to see it. Don’t expect to find it the first time you choose to show up, or even the 50th time. It will reveal itself when you’re ready, in other words when you’ve been purified through your regular sadhana. This entry was posted in yoga and tagged asana, bhagavad gita, japa, magic, sadhana, tapas, yoga. Bookmark the permalink.